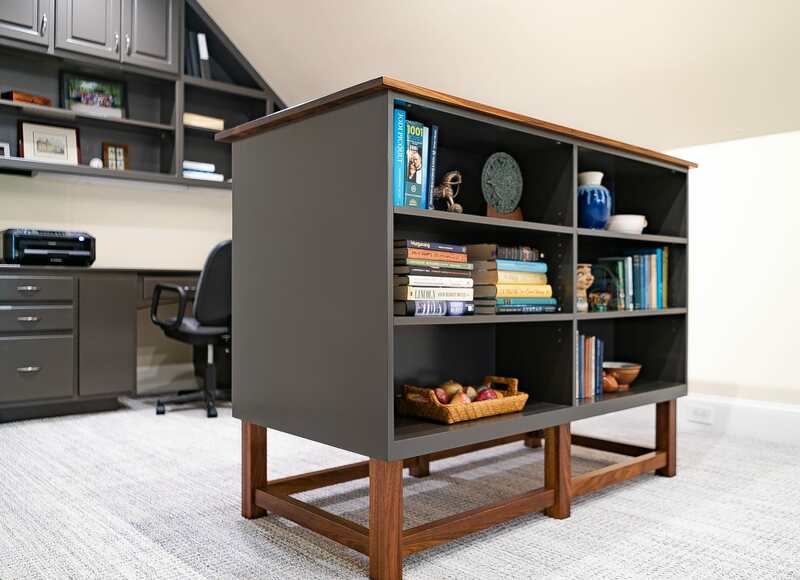 The Kluiters are empty nesters and wanted to convert their playroom over the garage into a dual-purpose space: a work area for Edward and a cozy den for relaxing and watching TV. We first selected new carpet, paint and overhead lighting for the space and then addressed their needs for seating and furniture. Edward is 6’6” and Helen is 6’ so everything was designed with their comfort in mind. 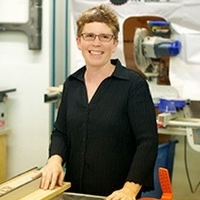 Jane talked at length to the Kluiters and designed and built a stunning 47” tall standing desk. 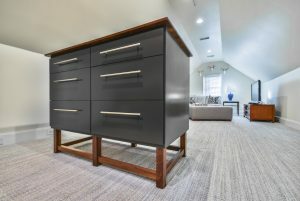 The beauty of this piece is that It also serves as a room divider, with workspace and storage on the office side and display space on the den side. The den area received all new comfortable seating (extra deep and extra long! ), furniture and lamps. The Kluiters are now able to work, read and entertain friends and family in what used to be a junk room! 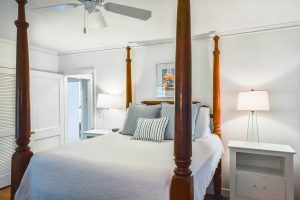 The Dorns wanted to freshen up their master bedroom and feature their queen sized plantation bed, a beautiful family heirloom that was built in the 1850’s. The challenge here was to find bedside tables that 1) were high enough for the bed and 2) could accommodate lots of books and newspapers. After an extensive search with all of our vendors, nothing available would work. Jane to the rescue! 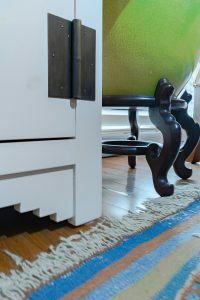 She designed and built 2 tables that perfectly fit the needs and proportions of the Dorn’s bedroom. 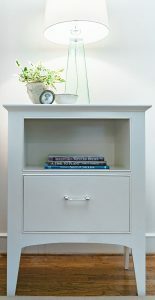 They are finished with soft close drawers, a soft neutral paint color and lucite pulls. 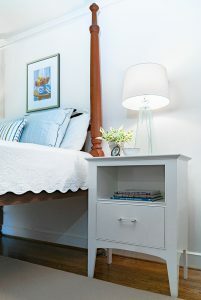 Lamps were chosen specifically for reading and create a pretty mix of glass and metal to compliment the warm wood tones of the bed. Evie’s Still Hopes apartment is beautifully appointed with many treasures inherited from her mother, who lived in Japan for several years. 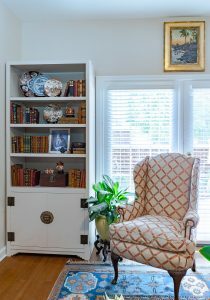 Jane built 2 bookcases to flank the doors to the patio that incorporate those treasures. 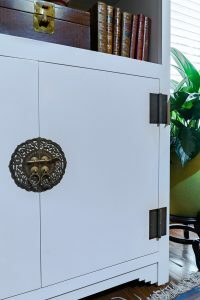 They’re finished with paint matching the walls and hardware reflecting an Asian influence, creating seamless and beautiful pieces that catch your eye right as you enter her front door. Jane, a Rock Hill native, has her BS in Business from the University of South Carolina, Columbia. Everything she builds is a work of art. She started her carpentry skills watching her daddy, as a young girl. She has perfected her craft since joining KJA 15 years ago. Sarah and Katherine are so fortunate to have her expertise right under the same roof. 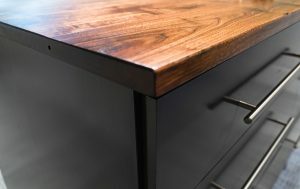 We get to be a part of each piece, start to finish. What beautiful, thoughtful, practical design for each individual. Thank you for showcasing Jane’s pieces. She has shared her enthusiasm for the full spectrum of services you all provide.